Andrew Bradfield lived in New Zealand. During high school, he became very interested in arcade game conversions and was interested in programming his own computer game. Shortly after finishing high school he taught himself assembler language and supported and advised by Todd Gramstrup, a local Atari enthusiast, soon started writing games. During this time, he met Harvey Kong Tin. Together, they developed the game “Laser Hawk”, which was influenced by Tail of Beta Lyrae. 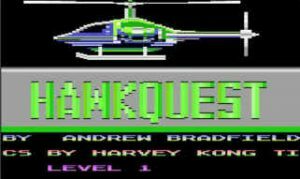 The two men then went on to co-create and produce “HawkQuest”. Bradfield was a member of the Dunedin Atari User Group. Some years after co-creating the games Andrew developed leukaemia. Bradfield died in 2001, aged 35. Andrew has been described as being a very logical thinker and a lover of fast cars.